Confession: When I’m out tasking in Paris, I always carry at least one meringue cookie in my trench coat pocket or bag at all times. Sweet and crunchy, it’s the ultimate instant sugar rush, making the perfect portable snack. Be choosy! Goldilocks, size does matter, so I recommend going with a medium-sized cookie because the smaller ones are sometimes on the dry side, and the larger ones are occasionally too soft. 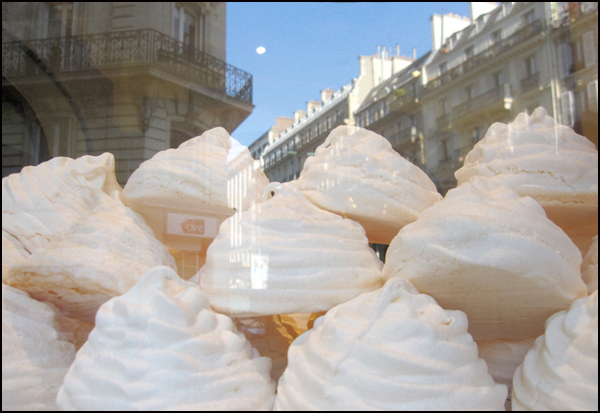 You’ll find the meringue in pâtisseries throughout the city. My favorite current sweet spot is the Boulangerie de Rennes at 101 rue de Rennes. You can’t miss them. Here the pretties hold court in the shop’s street side vitrine. 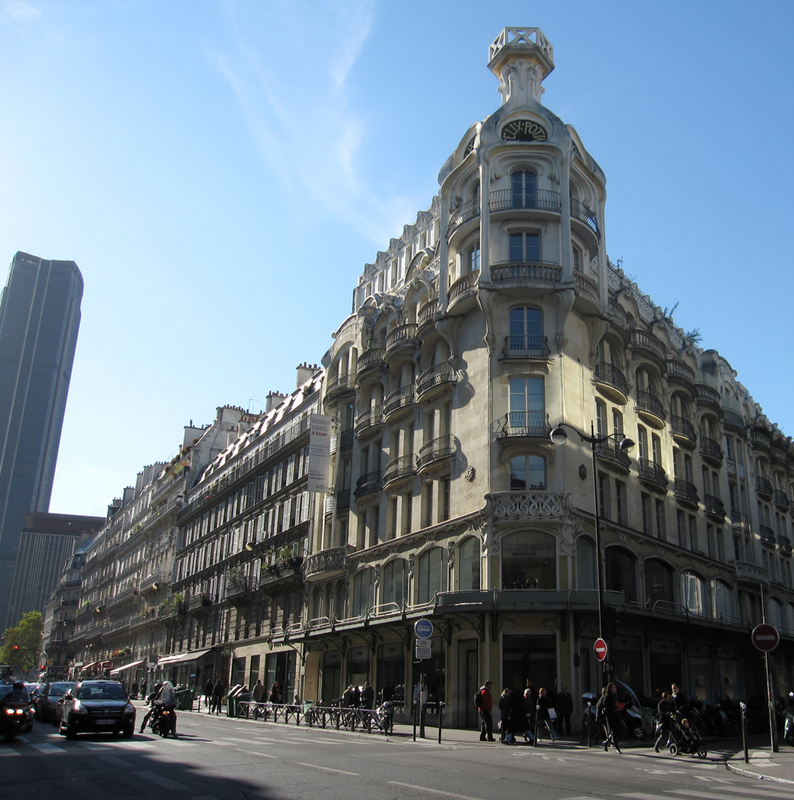 By the way, rue de Rennes is also one of my favorite window-shopping hotspots in Paris. For the love of juxtaposition, here the trendy boutiques mesh with classic Parisian shops. So add it to your photo bucket list! Even street photographer Eugène Atget shot here. Would would Julia Child do? She’d hotfoot it to rue de Rennes for kitchenware. 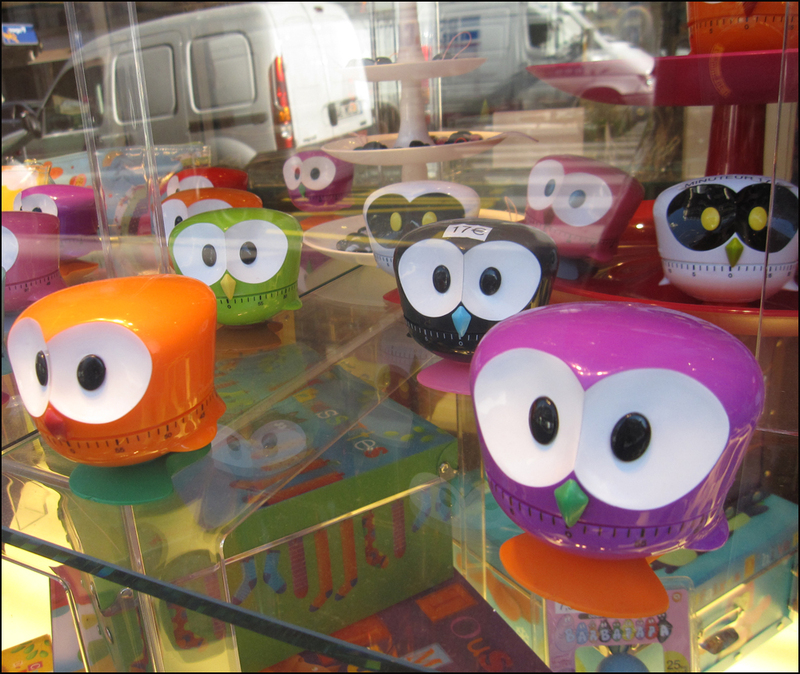 Here you’ll find a cluster of fun and practical shops definitely worth a browse : La Vaissellerie (85), Culinarion (99), and Plastiques (103) where bold and beautiful owl-shaped egg timers rule the roost. Le Creuset also makes a cameo appearance here. Your cuisine will thank you. Really like that meringue reflection picture – not sure about keeping one in my pocket though! The only place I know of for cookware is E. Dehillerin. I read about it in the Barefoot Contessa Paris book and there did seem to be a lot of americans there when I went, they have her to thank for a lot of business! Love that picture of the meringues! Ah! 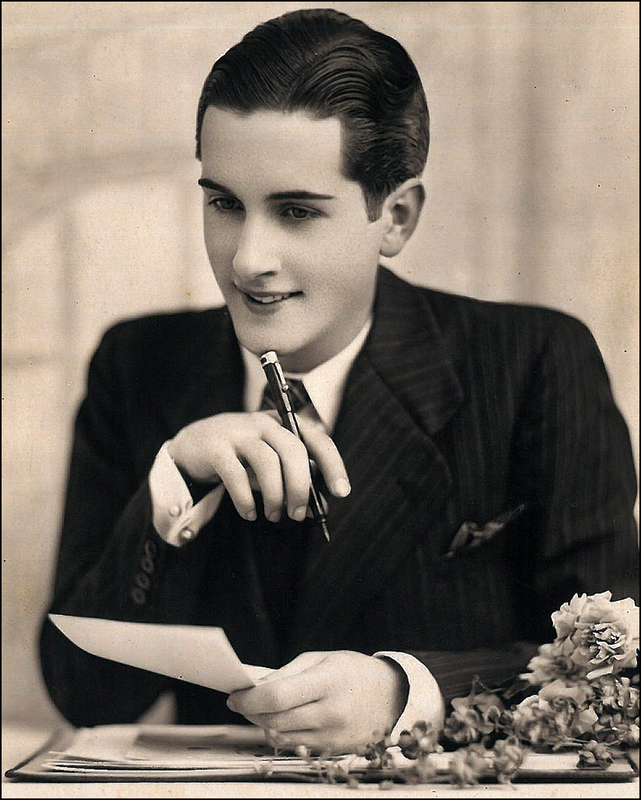 I missed that–the place was too packed to be able to take note of much of anything. Well, I’m very pleased I went to Julia’s favorite store then. I still have my bench scrapers stamped with the store’s name and address. I love even the name of the street it is on! Oh I want some French cookies! I miss them!